Comfort dehydrated skin with this long-lasting hydrating serum that prevents visible signs of aging caused by dehydration. 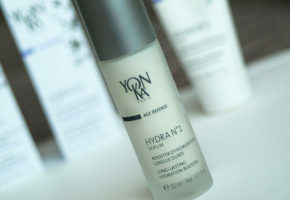 Enriched with a double dose of hyaluronic acid light, imperata cylindrica grass, and aloe vera, this creamy and refreshing gel is quickly absorbed and seeps deep into pores, making it the perfect emergency remedy for very dehydrated skin. It intensifies the effects of Hydra N°1 Crème and is great for mature skin. 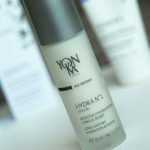 In the morning and/or evening, after cleansing and spraying on Lotion Yon-Ka, apply the serum (pump 2 or 3 times) to the face and neck, then Hydra N°1 Crème for dry or sensitive skin or Hydra N°1 Fluide for normal to oily skin. In addition, use Masque N°1 once or twice a week. SERUM + CREME:instant and significant hydrating effect: +144% over 8 hours. SERUM + FLUIDE:instant and significant hydrating effect: +122% over 8 hours.